Rougepout Beauty: Now is the HOURGLASS of my bank managers discontent! Now is the HOURGLASS of my bank managers discontent! You've been on the journey with me for years and you already know that when it comes down to the wire, I have absolutely no willpower when makeup and skincare are in the frame. 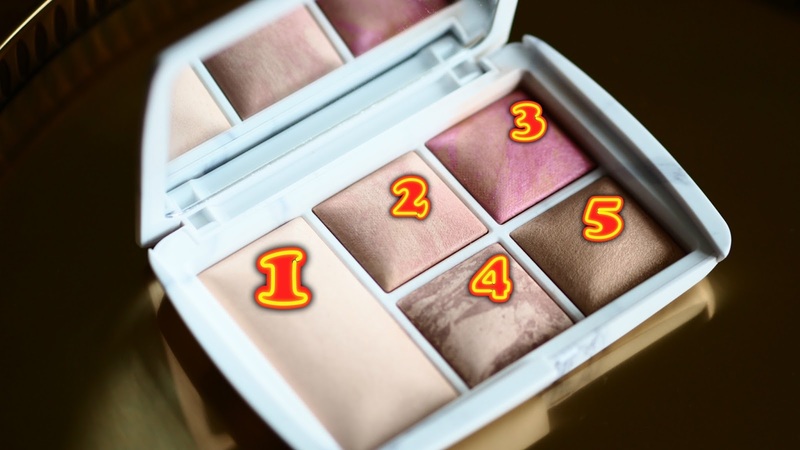 I recently confessed that SpaceNk dared to offer £15 off and I practically ran to my laptop to order the new Ambient Lighting Edit - Surreal Light palette from Hourglass. Hourglass stepped away from their iconic gold packaging and in my opinion arrived late to the game with this matte marble effect palette, marble appears to have been and gone, but, this palette was no doubt designed when marble was the must have as a blogger. Let's get to the pretty stuff and this packs a lovely pretty powdery punch. Never before seen colours, this surreal palette includes 1. Finishing Powder - Surreal Light - so soft, it is almost like dusting icing sugar on the face, such a beautiful flattering texture. 2. Blush - Surreal Glow - this a delicate touch of colour, the warmth is achieved with the streams of soft pinky/apricot colours blended through the powder. 3. Blush - Surreal Effect - this is a personal favourite and just leaps out with its flattering pink warmth, there is a hint of coral/orange to lift the shade and give depth. 4. Bronzer - Surreal Bronze Light - even me and my heavy handedness can't get this wrong, super flattering, a delicate bronzer, that gives a natural glow you can barely believe it's from a powder. Although strong mauves are throughout this powder the gentle champagne tones help dilute the colour and give a sophisticated finish to this powder. 5. Strobe Powder - Surreal Strobe Light -perfect as a highlighter, this glides over the cheekbones creating an ethereal effect to the face, soft and gentle, it's the modern day answer to the old method of using Vaseline over the camera lens. With a large mirror encased within the lid of the palette, I couldn't wish for a prettier item to have yet again proved my will power is weak and the force of the palette is strong.